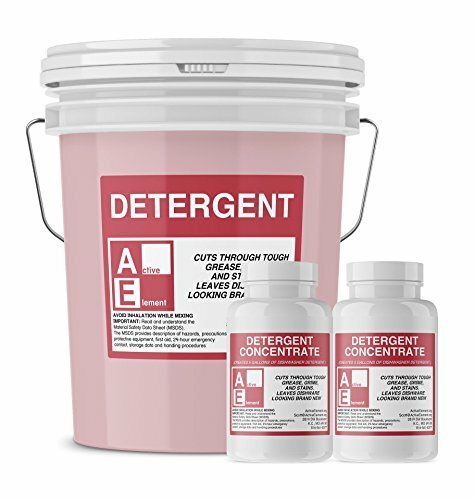 Active Element's commercial-grade detergent contains powerful cleaning action that targets tough grease, grime and stains leaving dishes looking brand new. Great for any food service kitchen including restaurants, diners, hotels, schools and not-for-profits. Intended for use in both high and low commercial dishwashers with water temperature above 120 degrees Fahrenheit. Shipped as a concentrate, each unit (2-bottles) is diluted with water to make 5-gallons of powerful detergent (Pail is not included). Simply pour concentrate into empty 5-gallon pail. Fill pail with water. Apply label and ready for use. Mix in a well ventilated area or outdoors and avoid inhalation. Not for household use. Do not use on aluminum kitchen ware. Read and understand the SDS. The SDS provides description of hazards, precautions, personal protective equipment, first aid, 24-hour emergency contact, storage data and handling procedures.